Eighteen teams are taking part in the WPA Women’s Doubles at Kapiti (Saturday, 7 April 2018). Eight teams are taking part in the WPA Women’s Triples at Kapiti (Sunday, 8 April 2018). 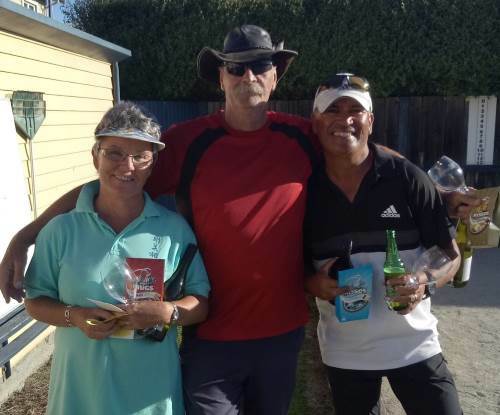 Thirteen teams took part in the 14th annual Hawke’s Bay Autumn Triples at the Hawke’s Bay Lawn Tennis and Squash (HBLTS) club in Napier the week before Easter. The cramped playing calendar this season, with the National Triples, Trans Tasman and Easter all happening in March has probably had an impact on the numbers attending the Autumn Triples, but it didn’t stop those who attended from having an enjoyable weekend of pétanque. Sharon Cannon, Dez Grant and Sarah-Jane Wright made to through to the Trophy final for the third year in a row. Unfortunately, it did not prove to be third time lucky as they were beaten by Maurice Belz, Dave Gatchell and Bethne Rouse. 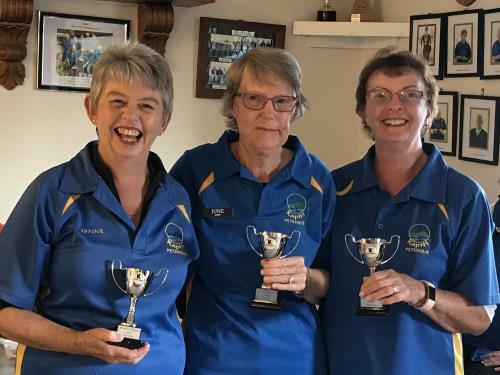 Eight teams took part in the WPA Women’s Triples at Kapiti. After the four qualifying rounds, the top four teams progressed through to the Trophy Knockout and the bottom four went into the Plate Knockout. The Trophy final was won by June Cody/Kathy Gatford/Lynne Shepherd who beat Yvonne Futcher/Annick Le Guen/Monica Smiler 13-11. In the Plate final Shona Callera/Noeline Corley/Judith Smith beat Ann Hogg/Shirley MacDonald/Sheryl Parslow 13-11. 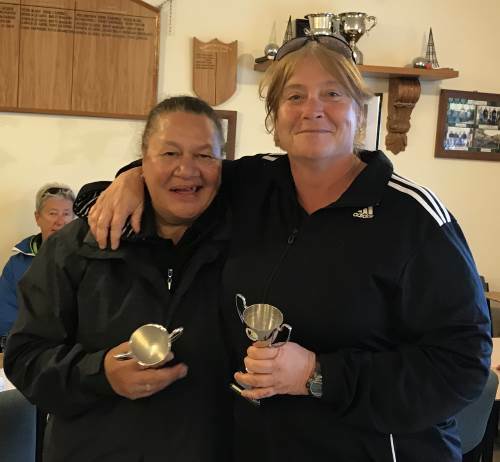 Eighteen teams took part in the WPA Women’s Doubles at Kapiti last Saturday. After the four qualifying rounds, the top four teams progressed through to the Trophy Knockout, the second four qualified for the Plate, the third four qualified for the Bowl, the fourth four qualified for the Bowl Consolation and the last two teams went into the Teaspooon final. The Trophy final was won by Yvonne Futcher and Annick Le Guen. The Plate final was won by Colleen Horton and Linda Millard. The Bowl final was won by Christine Strichen and Claire Wilson. Trish Biddle-Amoroa and Mary Joblin won the Bowl Consolation. Fran Beach and Bernadette Lawton won the Teaspoon. Twenty teams from thirteen clubs are taking part in the National Club Championships in Rotorua next weekend (21-22 April 2018). Kapiti’s second defence for 2018 was away at Hataitai. Kapiti started strongly, winning two of the three first round games. Hataitai won all three seond round games to lead 4-2. In the third round, Hataitai picked up two wins to claim the Jacques Cochonnet Challenge Trophy for the sixth time. Kapiti’s loss meant that they matched their longest winning run of 4 games, which they have done twice before (2012 and 2016). Hataitai’s first defence is away at Otaki. Twenty teams (from thirteen clubs) took part in the National Club Championships at Rotorua (21-22 April). Each team comprised 6 players in two Triples combinations. The first day was a five round Swiss, where Team A played the opposing team B, while Sunday was another five round Swiss with Team A playing Team A and B versus B. The two results were then added together to determine the overall winner. At the end of Saturday, Bay View White and Herne Bay Red led the field with 8 wins from 10 games. Kapiti Blue were next on 7 wins, and then a further six clubs on 6 wins, including defending champions Herne Bay Puma (previously Green). On Sunday, first Herne Bay Red dropped a game then Bay View White dropped a game. In the third round they played each other and shared the games 1-1. This allowed Herne Bay Puma to catch them. In the fourth round, Bay View and Herne Bay Red won both their games, while Herne Bay Puma dropped a game against Christchurch. Kapiti Blue moved back into the top four by beating Herne Bay Green. In an unexpected final round draw, Herne Bay Red faced Herne Bay Puma while Bay View White faced Bay View Red. Bay View White won both games and then faced an anxious wait to see if Herne Bay Red could match their points total. Herne Bay Puma won both games but finished three points short of Bay View White’s total. Meanwhile Kapiti Blue also won both their games to relegate Herne Bay Puma into third place. Masterton won the Senior team competition ahead of Northcote Red and Taieri. The video of the 2018 WBS Open Triples final at Masterton is now on the Wellington Pétanque YouTube channel. Thirty-two players have entered the WPA Women’s Singles Championship at Horowhenua this Saturday (28 April). It is with great sadness that the Wanganui East Pétanque Club advise that their club mate and friend Pete Hamilton passed away last night. Pete will be remembered for his presence, humour and prowess on the piste. He was so passionate about pétanque and he was a great club mate and we will miss him so much. and these will be passed on to the family. 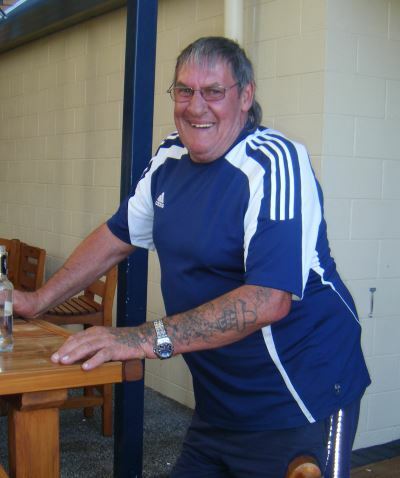 Pete’s family have advised that there will be a time of remembrance for Pete on Wednesday, 2 May at 2:00pm at the Wanganui East Club, 101 Wakefield Street, Wanganui East. The video of the 2018 WPA Regional Triples Championship final at Manawatu is now on the Wellington Pétanque YouTube channel.